Master piano plate welder, Victor Apuango, demonstrates his craft as Joe Hanerfeld, of Craftsman Piano, speaks about plate welding at his Yonkers, NY piano showroom. We use the world’s finest parts which are used in the best pianos such as the Hamburg Steinways, Bosendorfers and Mason & Hamlins, with all of our piano restorations. Our technicians take pride in paying attention to every detail and are truly dedicated to doing the job as if it were their own piano. 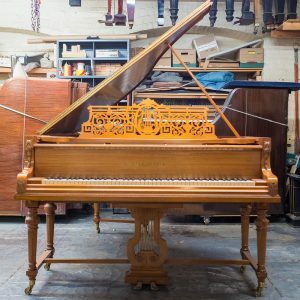 The piano restoration process takes approximately 12-16 weeks from the time your piano is picked up, and we guarantee our grand pianos for five years on all parts and labor and three years for uprights.